It's National Bread Week 16 - 22 April, 2013. Bread has been a part of our staple diet for over 5000 years. It all started in the stone age and has continued to evolve from unleavened breads through natural 'sourdough' yeasts, brewers yeast breads and now the sourdoughs are coming back into favour again! 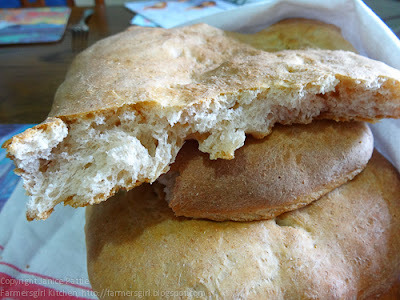 And I'm sure you will agree there is nothing more inviting than the smell of freshly baked bread. 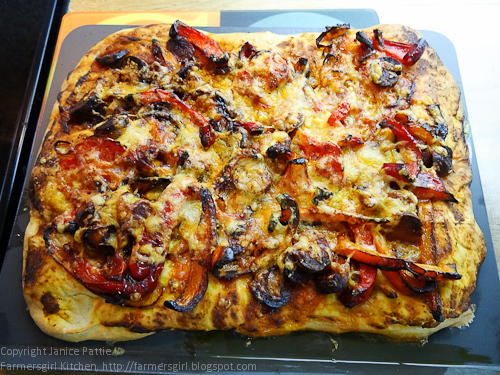 In honour of this celebration of baking bread, I have a couple of flatbreads to share with you. I received this Mermaid Baking Sheet to help me with my bread baking. 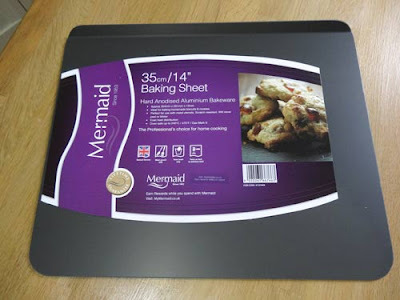 Mermaid is a range of hard anodised aluminium cookware that offers a solution for every culinary need. I used the bread maker and just put all the ingredients in the machine and set it for dough. However, if you don't have one you can make it by hand. Put all the ingredients in a large bowl and add the salt and the yeast keeping them away from each other. Add the olive oil and 150ml of the water and mix. 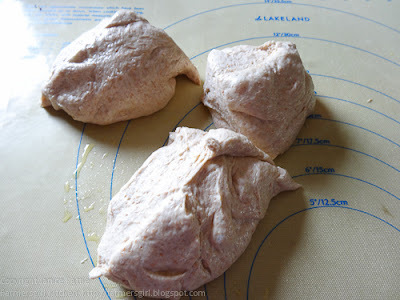 Add the remaining water a little at a time until you have a smooth, soft dough. Tip the dough onto an oiled surface and knead for 5-10 minutes until smooth. Leave to rise until doubled in size. Heat the oven to 200C, pour the oil into the Mermaid Deep Sided Handled Roaster and add the onions, peppers and tomato and coat in the oil, roast for 20 minutes, then add the sliced chorizo and cook for another 5 minutes. Remove from the oven and cool slightly. 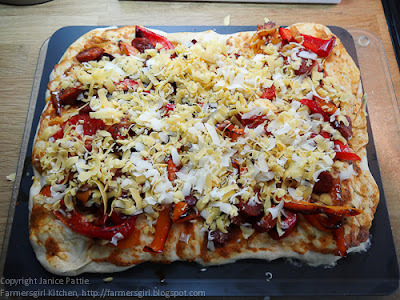 Once risen, roll the pizza dough out and place on the tray add the topping and scatter with a mixture of grated cheddar and parmesan cheese. Bake for 15-20 minutes until the bread is golden and, risen and the cheese is bubbling. 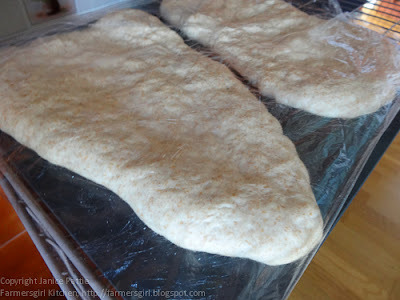 The technique for making the Naan Bread is pretty much the same as making the pizza dough. If you don't have spelt flour or prefer not to use it, then you can make all white flour Naans, but reduce the milk to 250ml. Bake at 220C for 10 to 15 minutes, then remove from the oven and stack the breads on top of each other and voer with a clean, dry cloth to keep the cursts soft and preven them drying out. Naan bread is brilliant for soaking up all the delicious sauce in a curry or other stews and gravies. 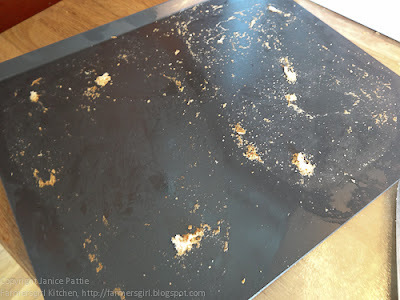 I was a little disappointed that the Naan bread stuck to the baking tray even though I had oiled it. I will have to try the semolina trick that Paul Hollywood uses to keep the dough from sticking. These look great! I adore bread in all of its forms. 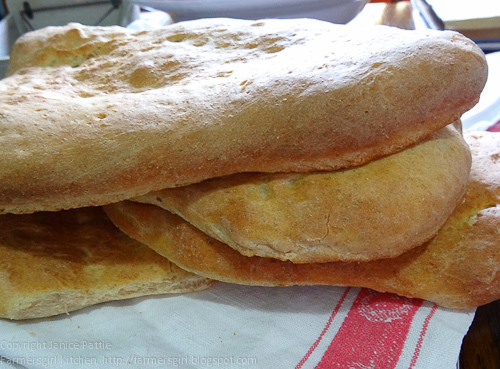 The semolina adds a really great "restaurant" flavour to bread-based things like pizza, I really recommend it. And may I say - you are looking radiant in your new profile picture! Ooh yummy! 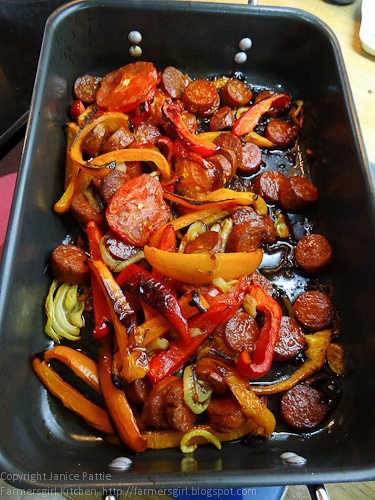 Love the roasted veggies on the pizza can imagine they give such a lovely flavour along with the chorizo! Both look great, but especially the naan bread! Will have to check out the recipe. Great looking those breads are. Baking bread is also very high on my list and I do it regularly. Just to mention, I had a pizza like this lately, too ... it was only chorizo and chilli. Naan I had just last week and ... I will have it again. It's all worth the effort. What's on Farmersgirl Kitchen Table? Posh Hake in a Hurry! A cup of coffee and a Treacle Bite!